In the past few years (probably longer), it's become a common joke to refer to Easter as Zombie Jesus Day or something to that effect. It might actually have been around longer than that, but to me it's been more noticeable lately. The pic to the left was one such mention of it that I saw on Facebook yesterday. See, he rose from the dead, just like a zombie. Get it? Sometimes the line between humor and criticism is blurry, and whether this is meant as one or the other varies from instance to instance. Nevertheless, the claim that Easter features a zombie Jesus is misrepresentative of Christian theology and the zombie genre. As it happens, I'm a big fan of both, so I feel some measure of responsibility to delve into the differences between Christian belief about the resurrection, and zombie mythology. Let's begin with how zombies are conceptualized. At its most basic, a zombie is a corpse that has been reanimated. While not every story features an explanation of how this happens, a fair amount identifies its origins as viral. According to Max Brooks' Zombie Survival Guide, this virus overtakes the brain, alters it, and ultimately destroys its normal functioning. In addition, it stops the heart, rendering the subject dead. Through its alteration of the brain, it reanimates the body, although this newly revived corpse bears little resemblance to what it did before both in terms of mechanism and appearance. The virally-corrupted brain asserts enough control over the body's capacity to walk and, at times, grab, but it essentially drags the body along. All other organs no longer work, and the zombie doesn't have the same use of its motor skills as it did before. Furthermore, the reanimated corpse is still a corpse. This means it will continue to decay. It no longer discerns relationships; no longer differentiates between loved one and enemy. It doesn't remember who it is or its place in the world as a person. It only knows what the virus causes it to know: a hunger for other living flesh. In other words, the body is no longer what or who it was physically or mentally. It was dead, and now it is, in its revived form, undead. Animated, but still dead. Let's contrast these characteristics with claims about what Jesus is like after the resurrection. First, in two separate Gospel accounts, Jesus is said to be unrecognizable to people when they encounter him: Mary Magdalene in John 20, and the two disciples on the road to Emmaus in Luke 24. It is not until he does something familiar that they finally do recognize him. In Mary's case, he says her name, and in the disciples' case, he breaks bread with them. This suggests some altered, new physical form, or at least some inability to recognize him on the part of the observer. Furthermore, Jesus remembers past relationships and continues to interact through normal means. Not all flesh is alike, but there is one flesh for human beings, another for animals, another for birds, and another for fish. There are both heavenly bodies and earthly bodies, but the glory of the heavenly is one thing, and that of the earthly is another. There is one glory of the sun, and another glory of the moon, and another glory of the stars; indeed, star differs from star in glory. So it is with the resurrection of the dead. What is sown is perishable, what is raised is imperishable. It is sown in dishonour, it is raised in glory. It is sown in weakness, it is raised in power. It is sown a physical body, it is raised a spiritual body. If there is a physical body, there is also a spiritual body. Thus it is written, ‘The first man, Adam, became a living being’; the last Adam became a life-giving spirit. But it is not the spiritual that is first, but the physical, and then the spiritual. The first man was from the earth, a man of dust; the second man is* from heaven. As was the man of dust, so are those who are of the dust; and as is the man of heaven, so are those who are of heaven. Just as we have borne the image of the man of dust, we will also bear the image of the man of heaven. The term "spiritual body" is an oxymoron. How can a spiritual thing also have a physical body? The essence of what Paul is saying here is that one's resurrected form is something new, imperishable, glorious, powerful. This may be what the Gospel writers had in mind when Jesus was not immediately recognizable to some who encountered him. Contrast this with a zombie, which remains in its old, worn out, degenerating flesh. We next move to John 20:19-31, which is commonly known as the "doubting Thomas" story. Jesus twice appears to the disciples in a shut room, again indicating that he has taken on a new imperishable form. At the same time, however, he shows Thomas his crucifixion wounds. Some may argue that Jesus here is still in his old body, and yet he has appeared in closed quarters. He is recognizable to Thomas, which may suggest that the presence of those wounds suggests that the former body has somehow been redeemed in the process of its transformation. He is still who he was, yet also something new. Once again, note that Jesus takes up familiar relationships and interactions. To save us some time here, note that he does this in every post-resurrection account in the New Testament. One final story worth discussing is the end of Luke 24, where Jesus suddenly appears among the disciples. He shows them his wounds as in John, but they think they're seeing a ghost. To prove he's more than a ghost, he eats a piece of fish in their presence. Not only does he elect to eat fish rather than take a bite out of Peter's arm, but he is also shown once again to have taken on a new form that confounds an easy dualistic spiritual/physical explanation. All of these show that Easter is not the celebration of a reanimated, still-decaying corpse that cannot discern relationship. A zombie is still very much subject to the power of death, just in a different, even more horrific way. 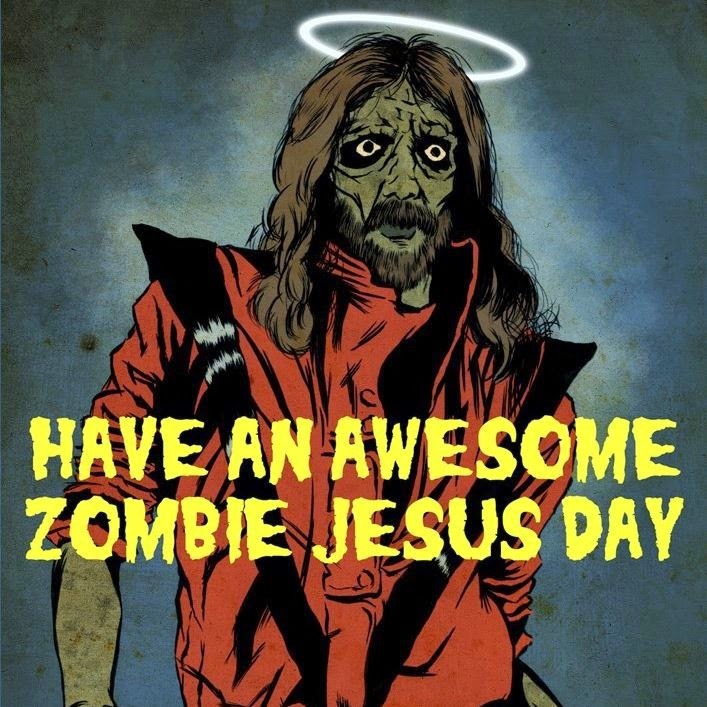 We do not proclaim, "Jesus is undead!" We proclaim "Jesus is risen!" And what Christians mean by "risen" is newly alive in an incorruptible, imperishable form that is somehow both physical and spiritual, no longer subject to the power of death in any way. Furthermore, when Christians claim that Christ is risen, we also mean that in a transcendent sense. At communion, we not only remember who Jesus was and what happened in his death and resurrection, but we proclaim his continuing presence with us, beyond the limitations of a single physical form. We proclaim that he is still watching, guiding, presiding, and loving. A zombie is not even its former self, incapable of interaction with us as it could in life. We dress up like zombies for Halloween. We celebrate Jesus' transcending death at Easter. These are the differences between the two.